Running through the Storms: My biggest Sin, can you believe I am going to ADMIT this??? My biggest Sin, can you believe I am going to ADMIT this??? If I was to be honest about what separates me from God... It would be WORRYING! I worry about the lack their of. I worry about not being good enough. I worry that I am not doing enough, being enough or measuring up enough. I worry about my job, husband, finances, family, student loan debt. I worry about friends, the future, the needs of others. It is my biggest sin. It causes me not to trust God and trust in my own abilities. It separates me from HIM! I hate it. I do everything I can to read books on worrying and memorize scripture. I am not the only one who STRUGGLES with this. I had the opportunity to review " Breaking the Worry Habit Forever" by Elizabeth George. Elizabeth George is best known for writing " A Woman After God's Own Heart". I am going to be honest with ya.. This was tough for me to get THROUGH.. Not because the material wasn't good, but because my heart knows I need to work on worrying. I know I need to trust God! It touches on so many areas of life where I worry. It touches on finances, marriage, children, what others think, singlehood, and other areas worry might be present. The book contains 2 parts. One part of the book is reading the chapters and the second part of the book has questions that go with the specific chapters. I love the questions because it requires you to dig down deep and be honest with yourself. It also has a section for personal notes. You can jot down things along the way. LOVE IT! This book made me so aware that worry consumes so much of my mind. Thank you Harvest House Publishers for allowing me to review this book. This book will help change your though patterns and your life. 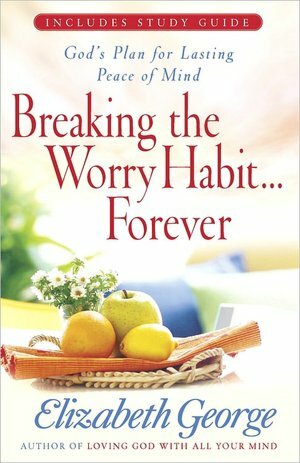 If you worry, this book is for YOU! It's ok honey. Try not to worry so much knowing you're not Iin it alone. I love you.